The Bible App is now available on the Apple Watch. When Apple Watch arrives, the Bible App will be there. That means that when the millions of people who have already bought Apple Watches start looking for apps to try out, they'll find the Bible App. ■ Read the Verse of the Day just by looking at your wrist. ■ Know that someone is thinking about you each time you feel that little vibration telling you one of your Friends Liked or Commented on your Bible activity. ■ Any time you think of it, glance to see which verses are trending. ■ Easily jump to your own Verse Images, Bookmarks, and Highlights. *We recognize that Apple Watch may not be immediately available in all countries and for all users. With the exception of trending Bible verses, you can find these same Bible App features on your iPhone or iPad. But there is only one version of the Bible App for iOS, no matter which Apple device you use. 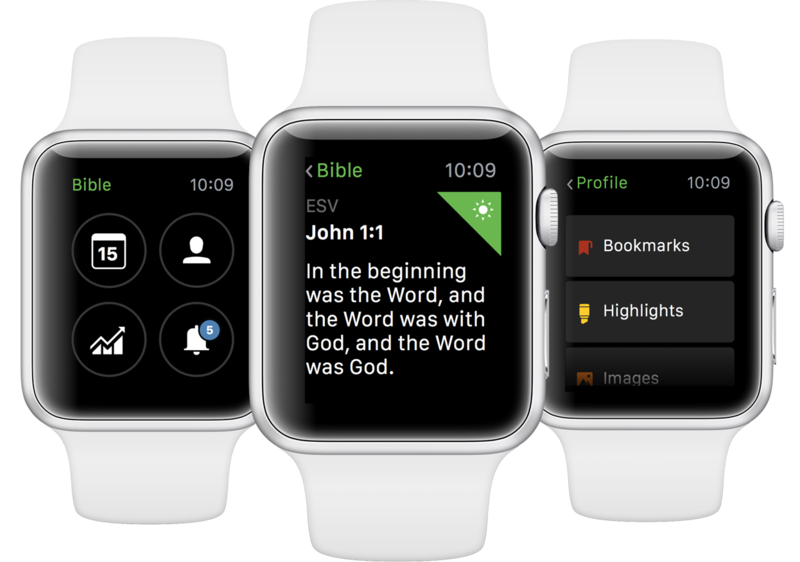 Apple Watch makes your Bible App experience more pleasant by making popular features even easier to get to.